This article is about generic Republic Troopers. For 2012 variant, see Jace Malcom. 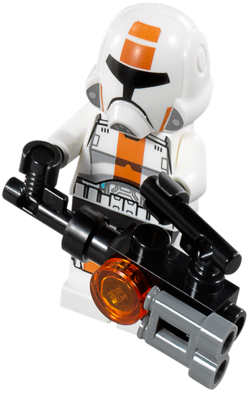 A Republic trooper is a minifigure from the Star Wars theme. 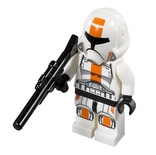 In 2013, two Republic troopers in armor with orange markings were released, which are included in the 75001 Republic Troopers vs. Sith Troopers battle pack. These troopers feature a white torso with black hands, with grey and black printing for outlining the various aspects of the armour, including belts at the base of the piece. An orange strip is also present in the centre of each torso on the chestplate. The backs of the torsos are printed with further armour printing, with features such as a backplate and the back of the belt depicted. White legs with a black hip joint are used, which are also printed with black, grey and orange, continuing on with the armoured design of the troopers. These variants of the trooper also each have a newly moulded white helmet piece, resembling the standard-issue helmet given to Republic troopers during the First and Second Great Galactic Wars. It includes black printing for a visor, an orange vertical strip above the visor with a thin orange at the bottom of each side of the piece. Finally, grey printing is used in the centre at the base of the helmets below the visor, depicting a breathing filter. The only difference between the two troopers are their heads and weapons. One comes armed with a blaster rifle and has a flesh-coloured head with a black smile and downturned eyebrows which has also been seen on minifigures such as Colonel Hardy, while is armed with a brick-build chaingun, but his head is not specified in the intstructions. This gives the builder the choice of three flesh-coloured heads to use for this trooper- one with an angry expression and facial outlining which has also been used on figures like Loki, one with a neutral expression used on minifigures such as the Cook from Pirates of the Caribbean, or one with a stern expression which has also been used for Lex Luthor. Republic troopers fought the forces of the Sith Empire during the First and Second Great Galactic Wars. Republic troopers were trained in the use of a variety of weapons, including blaster rifles, chain-guns and missile launchers. Troopers commonly fell into one of two classes- the Commandos, who were trained in advanced tactics and weaponry, and the Vanguard, with advanced heavy armour and trained in defensive strategies. Republic troopers were present in most major battles, including the Battles of Korriban and Alderaan. This page was last edited on 10 August 2016, at 22:30.